Algobeans is the brainchild of two data science enthusiasts, Annalyn (University of Cambridge) and Kenneth (Stanford University). We noticed that while data science is increasingly used to improve workplace decisions, many people know little about the field. Hence, we created Algobeans so that everyone and anyone can learn – be it an aspiring student or enterprising business professional. Each tutorial covers the important functions and assumptions of a data science technique, without any math or jargon. We also illustrate these techniques with real-world data and examples. Our posts are our own, and do not represent the views of our past/present employers. I was a statistics tutor at the University of Michigan (Ann Arbor). I completed my MPhil in Psychometrics at the University of Cambridge Psychometrics Centre, where I programmed cognitive tests for job recruitment. Disney Research later roped me into their behavioral sciences team, where I examined psychological profiles of consumers. I am also a data analyst for the Singapore government, and my analysis helps make informed decisions on large-scale public policy. In my free time, I participate in data mining competitions to help companies like Samsung and Yahoo! with their marketing strategies and recruitment decisions. The online crowdsourced analytics platform, CrowdANALYTIX, named me as a top solver in 2014. I am fluent in English and Mandarin Chinese, and can converse in Japanese – a skill gleaned from hours of watching too much anime. I was also a competitive archer representing Singapore in regional competitions. I am currently pursuing my MS in Statistics at Stanford University. Previously, I was at the University of Warwick and I was the top student for all 3 years of my MORSE degree. (MORSE: Mathematics, Operational Research, Statistics, and Economics). I was also a research assistant with the Operational Research & Management Sciences Group at University of Warwick, and worked on bi-objective robust optimization with applications in networks subject to random failures. I am interested in data analytics, and I am constantly honing my skills through reading and practice. From 2015 to 2016, I participated in a series of 4 data-related competitions organized by the Ministry of Defence (Singapore), Monetary Authority of Singapore, Singtel, and ConneXionsAsia, developing machine learning models as well as privacy protection methods, eventually placing podium finishes (top 3) for all of them. I enjoy traveling and have visited over 20 countries by the age of 23. I hope to use my skills to enhance policy-making in the government and improve the lives of ordinary citizens. Pssst… We also wrote a book. Numsense! 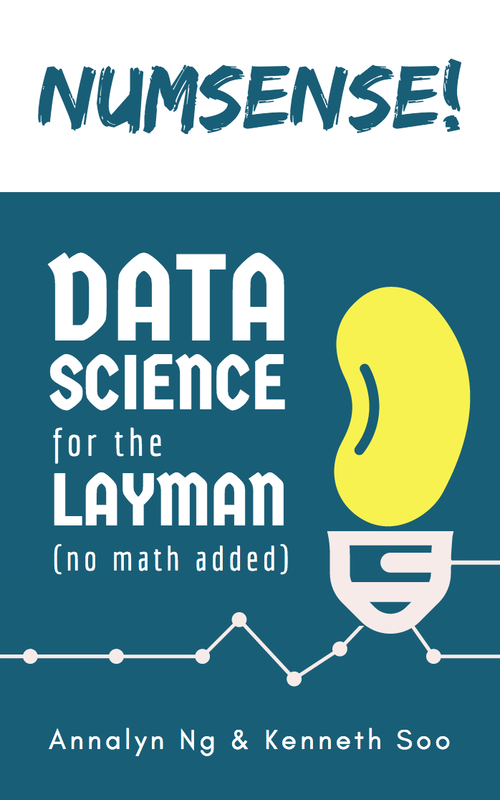 Data Science for the Layman (no math added) has been used by top universities like Stanford and Cambridge as introductory reference text. Download a free PDF sample here, or grab it at just $2.99 on Amazon. Hi Annalyn and Kenneth, just wanted to let you know that I’ve several business friends who read your book — and absolutely loved it! They are now able to identify which algorithms to use for different problems. To explain things like decision trees or regression to non-math majors is not easy. Thank you for your fantastic tutorials that help more people level up in this field. In response to Emanuele’s comment below, I’ve no doubt that if the book was indeed filled with stats and data munging, no layman would last beyond the first chapter. This book’s appeal is in its tactful simplicity. I bought your book, and after having completed the read, I think it’s very good as analytcs book but far from data science. In the book there are very poor information about statistic, data munging and visualization. Examples are useful just for machine learning, but rarely they are really connected to problems of data science. First of all, I appreciated your book, so I’m glad you suggested me other books. My previous message is not a criticism, but a suggestion to improve the next version of the book because I think the data science covers not only analytic topics, but it is also necessary to show all the processes of data science, with the same descriptive level used on machine learning algorithms about other topics. Such as “data quality”, the technique to get it and a correct way to display visualization to a good communication. Hi Emanuele, certainly! We’re always thinking of new topics to cover and we value your suggestions. Indeed a large part of actual data analysis is data cleaning and communicating findings. Hi, I just got this as a prospective text to use on a PG Data Journalism course, I’ve found the R repo but is there any other teaching material, slides etc available? great materials, thank you…. want to do one that helps to guide which methods/approaches are more relevant in which circumstances? just an idea – a “What method/approach should i use?’ tutorial for the layman (like me)? maybe a simplified version of something like this? What a superb idea, thank you! Very useful, thanks Naveen you’re great!